Aaron Rubinstein, designer, inventor, artist, jeweler has been featured in many articles Aaron has won hundreds of national awards for his bold artistic jewelry. Joined by his daughter, Haguit, their designs are contemporary and funky. They work in Sterling Silver and 14K gold using many natural gemstone cabochons and faceted stones. The gallery and museum quality jewelry is handmade in Cincinnati, Ohio in their studio/store. The Rubinsteins offer many one-of-a-kinds, as well as tried and true signature designs. Thank you for continuing to appreciate our work. Please check our calendar for upcoming shows. Modern Art Jewelry has been in business since 1968. 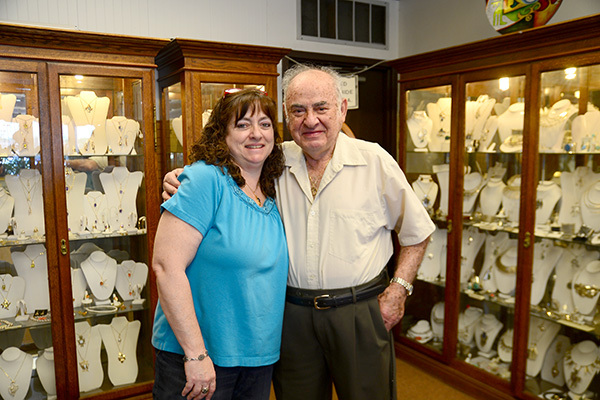 Come with old jewelry that needs an update, loose stones, or just a glimmer of an idea: Aaron Rubinstein and his daughter, Haguit Rubinstein-Towler, will create a piece you love—just as Aaron has been doing since 1968. They work with sterling silver, 14 karat gold and white gold, any stone (including atypical choices like fossils), and a local stone-cutter. Don’t be dissuaded by “modern” in the name: They do traditional designs too. —to talk with him and purchase his jewelry. been on the cover of Sunshine Artist twice. always been parts of her life. 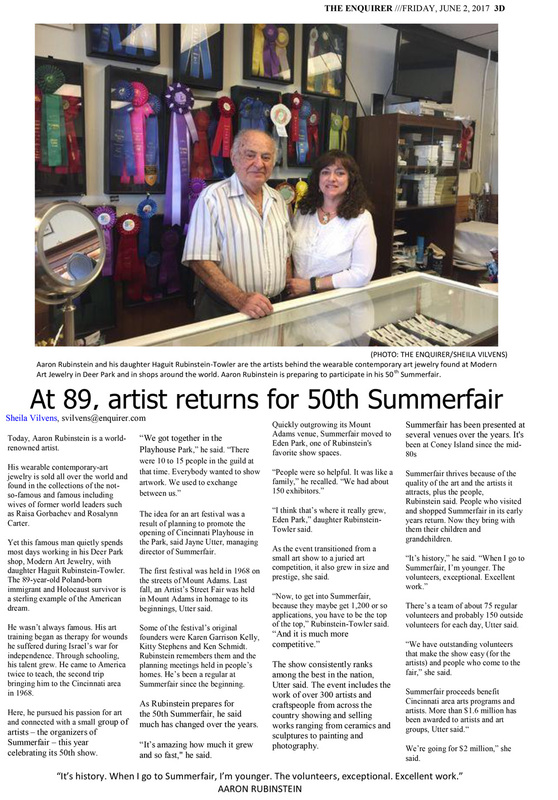 Soapbox sat down with the Rubinsteins to talk art, jewelry and Summerfair. You’ve showcased at Summerfair for the past 45 years—when did you begin making jewelry? 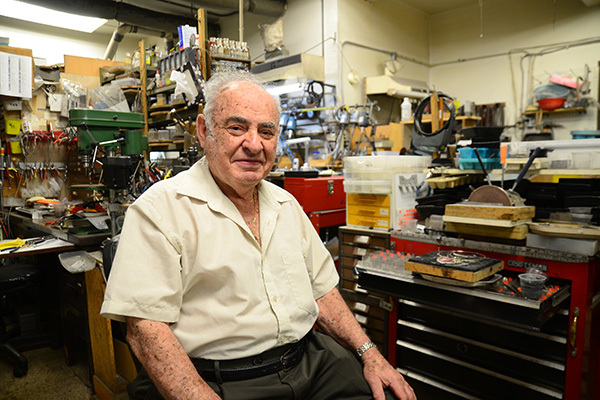 AR: I started making jewelry 59 years ago, in 1949. It was part of my physical therapy after I was injured. What got you interested in making jewelry? AR: It started as a hobby, and I fell in love with it. Have you tried your hand at other forms of art making? school but a very good school. I minored in jewelry. I came to Cincinnati in 1968 and started to develop the field of jewelry making. 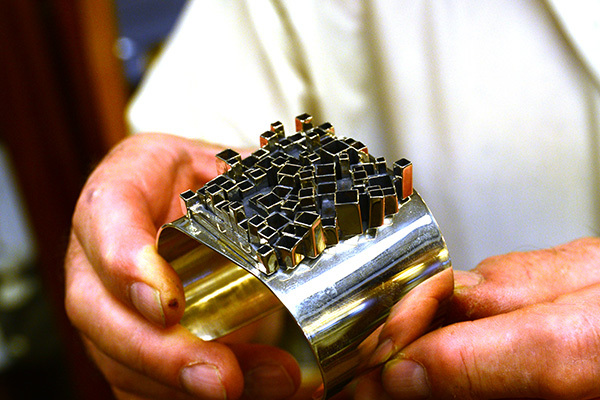 We build unique tools to make jewelry, which is our trademark. to school for automotive design. 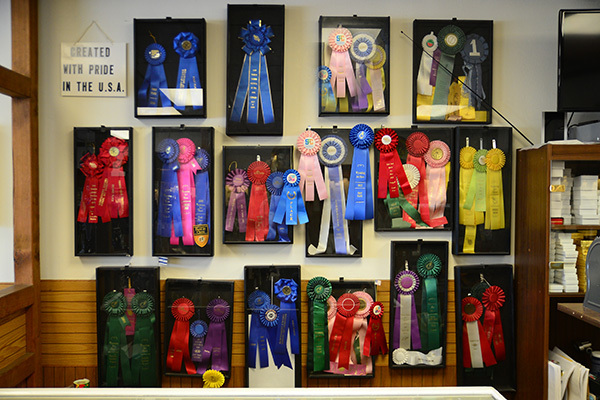 What do you like most about showcasing at Summerfair? Summerfair started, it’s made a huge change in the population’s approach to art. Houses are now decorated with art. culture to the area and helps promote new artists with grants and scholarships. You were given an award last year—can you tell me about it and what it means to you? friend of mine. It really touched me—her husband and two children presented the award to me. She was a sweet lady, energetic. Why did you decide to join your father in making jewelry? full-time in 2004 after my mother died. Is there a difference in style between your work and your father’s? my father’s designs more now too. And I use some of his pieces as a base and add my own style to it. What do you hope your jewelry brings to the Cincinnati area? into Louisville and then drove here to buy their wedding rings from me. Two years later, the man called and wanted me to size it for him. We’ve made wedding rings for the grandchildren of long-time customers. HRT: People come to Summerfair because he’s there. He’s a fixture there. People are coming to invest in his work for future investments. When people come to Summerfair wearing his work, other jewelry makers recognize it. It’s a huge compliment because jewelry is very competitive. If you missed Summerfair this year, make sure to catch it next year. 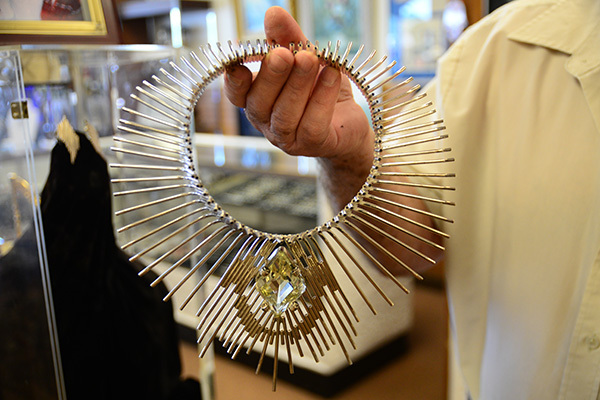 Aaron Rubinstein won first prize for wearable art-designed jewelry. Loveland was a busy beehive of activity at Nisbet Park Sept. 7. Thousands came out on a bright sunshiny day for the Loveland Arts Council 12th Annual Loveland Art Show in the park. Early morning clouds and rain gave way to clear skies, comfortable temperatures and a steady stream of patrons kept the artists happy throughout the day. The 80 artists exhibiting estimated more than 3,000 people turned out to browse and buy the wide variety of quality art they displayed. "I think it's the best turnout we've ever had," said Shawn Custis, president of the Loveland Arts Council. "I've heard nothing but excitement as there were a lot of buyers at this show; nothing but excitement!" Even with parking at a premium and every available space filled, nobody was complaining. Girl Scouts helped out at Kids Korner, where children had the chance to create their own works of art while mom and dad browsed the show. Local eateries provided food and refreshment at the Starving Artists Café. The most excitement centered on the art exhibited and the patrons who came to see it. "Excellent! Good crowd, well educated; their reaction was excellent," said Deer Park resident Aaron Rubinstein, an internationally recognized artist who won first place in the wearable art category. "The Arts Council gave excellent direction; there was constant traffic and nice people." 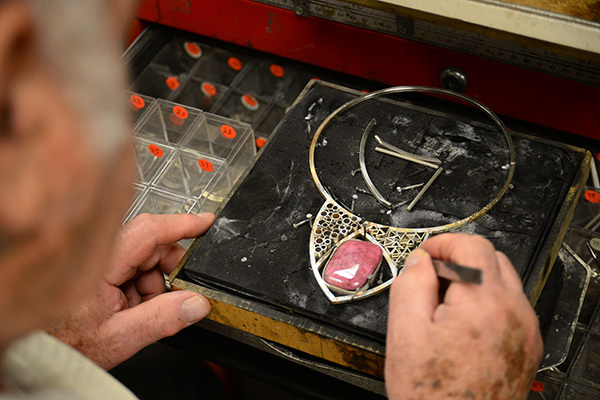 Rubinstein has been featured in the Enquirer and Cincinnati Magazine as one of Cincinnati's finest artists for his work designing artistic jewelry with gold, silver and gemstones. Judges awarded $1,200 in prizes to the top three artists in five separate categories including: painting, 3D sculpture, photo/prints/collage, wearable art and kids categories. Pat Olding uses a pallet knife for her oil-based paintings for which she won first place in the 2006 show here. She didn't win this year, but was happy to sell some of her work and meet the people. "I sold one of my big ones before I even finished setting up," she said. "I got involved in Loveland because of Deirdre Dyson. It's great; a great location." Artists from all over mixed with a lot of local artists to provide quality art in a nice setting for patrons who came to see their favorites and meet some new artists too. "Meeting people interested in your art makes it a success even if they don't buy," Olding said. "It's a success if I end up in the shade." At the end of the day the great crowd and great weather made the show a success for everyone. Kate Ungrund teaches art to first- to eighth-grade school children when she's not creating her own fabric art. She exhibits her art-quilting in a number of shows and sold several pieces. "This is one of the best," Ungrund said. "Great weather, the number of people; it's a nice place for a show."